North Korea, officially the Democratic People's Republic of Korea (DPRK), is a country in East Asia, in the northern part of the Korean Peninsula. The capital and largest city is Pyongyang. North Korea shares a land border with China to the north and north-west, along the Amnok (Yalu) and Tumen rivers. A small section of the Tumen River also forms North Korea's short border with Russia to the northeast. The Korean Demilitarized Zone marks the boundary between North Korea and South Korea. The legitimacy of this border is not accepted by either side, as both states claim to be the legitimate government of the entire peninsula. Korea was annexed by the Empire of Japan in 1910. In 1945, when Japan was defeated in World War II, Korea was divided into two occupied zones, with the north occupied by the Soviet Union and the south by the United States. Negotiations on unification failed, and in 1948 two separate governments were formed: the Democratic People's Republic of Korea in the north, and the Republic of Korea in the south. The conflicting claims of sovereignty led to the Korean War in 1950. An armistice in 1953 committed both to a cease-fire, but the two countries remain officially at war because a formal peace treaty was never signed. Both states were accepted into the United Nations in 1991. The DPRK holds elections and describes itself as a self-reliant socialist state, but it is widely considered a dictatorship and has been described as totalitarian and Stalinist with an elaborate cult of personality around Kim Il-sung and his family. Human rights violations in North Korea are in a category of their own with no parallel in the contemporary world as assessed by international human rights organizations. The Workers' Party of Korea, led by a member of the ruling family, holds power in the state and leads the Democratic Front for the Reunification of the Fatherland of which all political officers are required to be a member. Over time North Korea has gradually distanced itself from the world Communist movement. Juche, an ideology of national self-reliance, was introduced into the constitution as a "creative application of Marxism–Leninism" in 1972. In 2009, the constitution was amended again, quietly removing the brief references to communism. 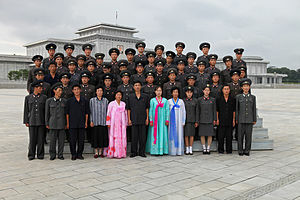 North Korea follows Songun, or "military-first" policy. It is the world's most militarized society, with a total of 9,495,000 active, reserve, and paramilitary personnel. Its active duty army of 1.21 million is the 4th largest in the world, after China, the U.S., and India. It possesses nuclear weapons. As a result of its isolation, it is sometimes known as the "hermit kingdom".